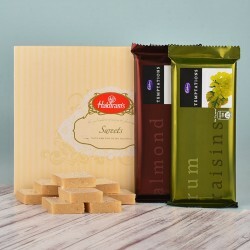 Celebrate this Raksha Bandhan with some modern sweets. 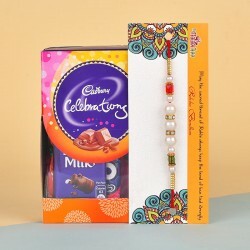 Surprise your Brother with a beautiful Rakhi and some delicious Chocolates. Name any Chocolate and we will get it packed for you. 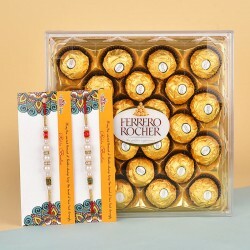 We have the best Chocolates and Rakhi combos that are sure to make your Brother feel on top of the world. Sweet and dense like chocolates, the relationship of a Brother and a Sister is the sweetest one. They fight, they care and they can fight with the whole wide world to protect each other. Only a Brother and a Sister can understand the depth of their relationship. 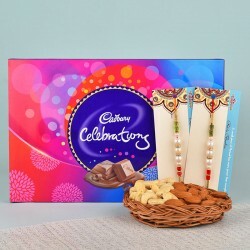 On this Raksha Bandhan, celebrate your childhood partnership with special rakhi chocolates. 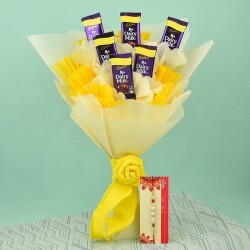 At MyFlowerTree, you will find the best collection of Chocolates which are perfect to be given as Gifts to Brothers as well as return Gifts for Sisters. Chocolates are loved by all which makes them perfect as Gifts. 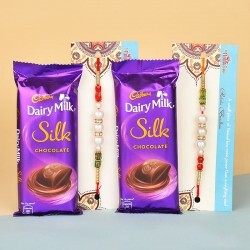 It would be a great idea to celebrate Rakhi with Chocolates. Instead of traditional sweets, wish your Brother and sister on this amazing festival with the sweetest Chocolates. We have some of the all-time favourite Chocolates like KitKat, Dairy Milk Fruit and Nuts, Temptations, 5 Star, Lindt, Ferrero Rocher, Dairy Milk Silk, Dairy Milk Oreo and more. We have many homemade Chocolates and Assorted chocolates as well. Chocolates would make for a perfect gift for both the brother and sister. Order one for your sibling before they melt. 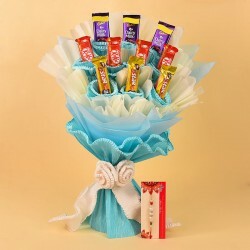 If sending simple chocolates is not enough for you, then, you are sure to love these Chocolate Gift Hampers. 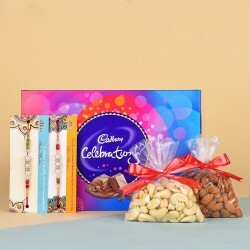 Our Raksha Bandhan special Chocolate gift hampers are without a doubt some of the best ones. 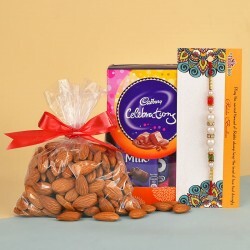 They have beautiful Rakhis, special Greeting Cards, delicious Cakes, fragrant Flowers, and more. When just one thing is not enough, send more because Raksha Bandhan comes only once in a year. Don't hold back and send the best goodies to your Brother. Rakhi is one of the most important things that symbolise Raksha Bandhan. A sister ties Rakhi on the wrist of her Brother and in exchange for that, the Brother promises to protect her for the rest of his life. 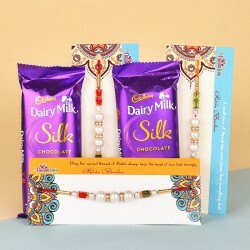 Every sister wants to buy the perfect Rakhi for his Brother and we are proud to say that we have the best Rakhis to strengthen the relationship of the best Brothers and Sisters. 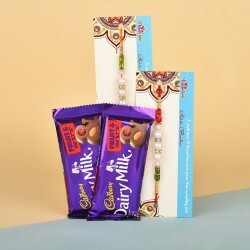 We have a collection of traditional Rakhis that have some of the most preferred motifs of peacocks, elephants, flowers and many other idols of Gods and Goddesses. 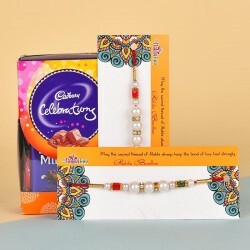 Our collection of Fancy Rakhi includes, Silver Rakhi, Kundan Rakhi, Pearl Rakhi, Rakhi Bracelets and more. If your Brother lives a little far from you, you have nothing to worry as MyFlowerTree delivers in all the major cities and various remote city areas as well. 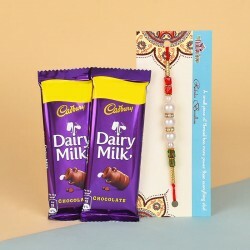 You can Send Rakhi to Indore, Bangalore, Chennai, Tamil Nadu, Mumbai, West Bengal, Rajasthan, Punjab, Haryana, Delhi, Puducherry, Karnataka, Hyderabad, Chandigarh, Bihar, Jharkhand, Jaipur, Himachal Pradesh, Uttarakhand, Uttar Pradesh and more. No place is too far with MyFlowerTree. 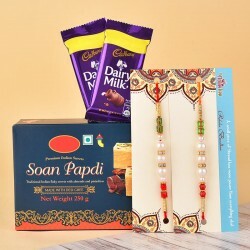 You can even send gifts and Rakhis to your Brothers living in other countries. Canada, Dubai, Australia, USA, France, Germany, Africa, Spain, Bangkok and more, our list is endless.